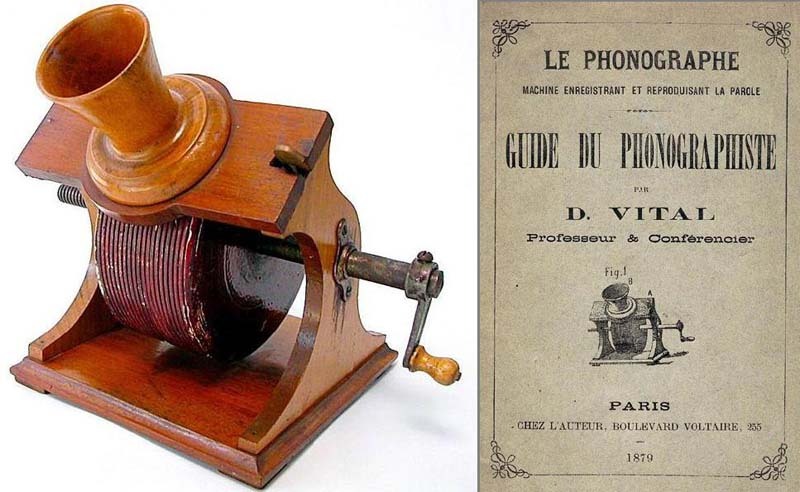 D. Vital was a professor and lecturer in Paris who manufactured phonographs in addition to putting on public exhibitions. Today he is best known for this very small machine, with a base measuring just under 6" x 6" and a mandrel only 2-1/8" wide and 4-1/4" in diameter. (Quite a contrast to the huge Kohl Exhibition tinfoil phonograph!) It is unique in that it is constructed almost entirely of wood, including the hinged speaker arm and small horn. Even more surprising is the mandrel, which is cast in plaster and painted deep maroon. Given the extreme fragility of this wood and plaster construction (compared to the typical cast iron and brass of other tinfoil phonographs) it is astonishing that any of these delicate machines have survived the past century and a quarter. Only four original Vital phonographs are known to exist today. This machine is complete with the original instruction book, the only copy believed to survive.